Have a question for DZR Guest House? Built in 2011, DZR Guest House is a distinct addition to Palawan and a smart choice for travelers. Only 1.0 km from the city center, the hotel's strategic location ensures that guests can quickly and easily reach many local points of interest. Also within easy reach are Puerto princesa city colesium, Robinson's Place Puerto Princesa, Puerto Princesa Airport. Take advantage of a wealth of unrivaled services and amenities at this Palawan hotel. Guests of the hotel can enjoy on-site features like free Wi-Fi in all rooms, Wi-Fi in public areas, valet parking, car park, room service. The hotel features 12 beautifully appointed guest rooms, many of which include internet access – wireless, internet access – wireless (complimentary), non smoking rooms, air conditioning, desk. The hotel offers wonderful recreational facilities such as massage, garden to make your stay truly unforgettable. 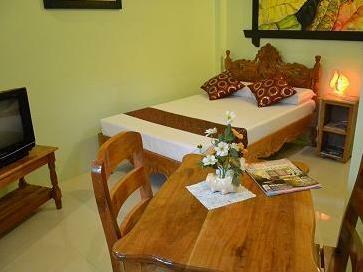 DZR Guest House is a smart choice for travelers to Palawan, offering a relaxed and hassle-free stay every time.